Leave your stress behind and take some relaxation home with you when you visit our expert massage and bodywork professionals at our spa and massage studio. The Mendocino Coast is the perfect place to unwind. Join us at our rustic and charming coastal spa sanctuary, situated in the heart of the village. 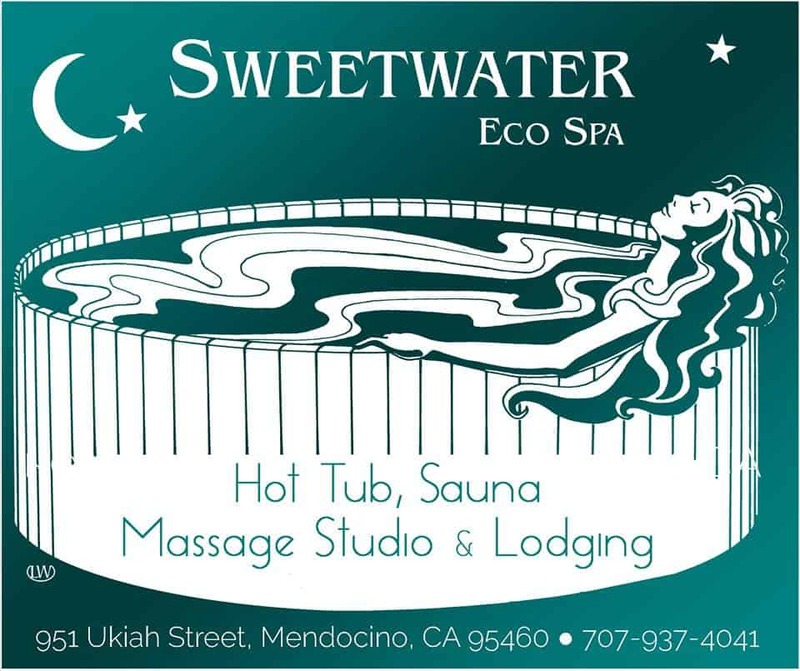 Since its founding 30 years ago, Sweetwater Eco Spa has become an iconic landmark of old Mendocino and a hub in the community. Locals and visitors alike gather here, sharing stories as they enjoy a relaxing soak in our communal redwood hot tub and an invigorating trip to our traditional cedarwood sauna. If you prefer the spa without the socializing, we also have private hot tubs and an infrared sauna available. In keeping with tradition, the communal hot tub and sauna are clothing-optional spaces. Our outstanding team of bodywork and massage professionals will have you relaxed in no time. With a variety of massage and bodywork treatments available, you can rest assured that you’ll leave our spa feeling rejuvenated and recharged. We offer an array of treatments, including Swedish Blend, Traditional Thai, Deep Tissue with or without Shiatsu, and Warm Stone treatments. All treatments come with a complimentary soak and sweat in the communal tub and sauna. See our complete list of massage treatments. Learn more about our different spa experiences and then select the one that’s best for you. The Communal Redwood Outdoor Hot Tub and Red Cedar Sauna experience is complimentary for guests of Sweetwater Inn and Nicholson House. Reserve this spa experience to enjoy your alone time and some peaceful relaxation. The space includes a private three person Redwood outdoor hot tub with private open air deck, private outdoor shower, private infrared sauna, and a private bathroom and changing area. For those who prefer a private soak but are looking for a traditional sauna experience, this package features a private outdoor 3 person hot tub, private shower, and access to the communal cedar wood sauna. The classic Sweetwater Eco Spa experience. Bring your friends and family or come alone and meet new friends as you gather in our communal 8’ redwood outdoor hot tub. Then, enjoy our red cedar traditional sauna. Both the communal hot tub and the communal sauna are clothing-optional. Indulge yourself! You’ll feel divine as you enjoy this luxurious and unique Sweetwater Spa experience. Start with a soak and a sweat in our hot tub and sauna, then dive into relaxation with your choice of Swedish or Deep Tissue Massage. After our expert massage therapists work on your pressure points and sore muscles, they will help you heal and relax with aromatherapy and achieve a deep state of calm with our foot, hand, and head reflexology. Sip on delicious citrus mint water, awaken your senses, and restore your body’s natural rhythms with this package that will leave you cleansed, relaxed, and rejuvenated. Your inner god or goddess will thank you! Safe for pregnant women. Perfect as a gift for your loved ones or yourself. The classic experience and an excellent introduction for those new to massage, our Swedish Massage Treatment improves circulation and blood flow to the muscles, leaving you refreshed and ready to face the world. Featuring warmth, friction, kneading, and long strokes, Swedish massage focuses on loosening up the muscles and thoroughly eliminating tension. Pairs nicely with aromatherapy and acupressure treatments. Should you realize that you need a deeper massage, all of our massage therapists are fully qualified, and you can upgrade your session to a deep tissue massage for an additional charge. This massage features gentle pressure to restore your lymphatic function and help cleanse your body. Ideal for pregnant women, people suffering from lymphedema, and anyone looking to give their lymphatic system a boost. When your body is working hard growing new life, you deserve to be pampered! This treatment is perfect as a gift to the expecting mother in your life — or to yourself. Let the aches and pains fade away as our trained massage therapists carefully work on your changing body, bolstering your circulatory and lymphatic health, improving your mood, and helping with pain points. When you need an extra boost, this is the way to go. Ideal for people suffering from muscle pain, posture problems, chronic pain, or certain medical conditions, Deep Tissue Massage works deeper, eases tension, and realigns your body, helping you heal. You also have the option to add Shiatsu, which involves the application of pressure to points throughout the body, restoring harmony and health. Shiatsu can help with problems ranging from sinusitis to arthritis. Please note that this treatment requires at least 24 hours advance notice to prepare. Revive and refresh yourself: reserve a warm stone treatment. Let the heat from these stones flow into your body, bringing calm and restoration. Breathe in and out and focus on the warmth as you ground yourself. Warm stone massages have been around for thousands of years, and generations of weary travelers have felt their healing powers. Stretch it out! When stress builds up, your body suffers. With our Thai Massage treatment, you will improve your flexibility, work out the pain and pressure points, relax knotted-up muscles, and restore order to your body’s natural energy flow. Thai massage can help with tension headaches, muscle and back pain, and nervous system flare-ups, and it improves circulatory and lymphatic health. Eliminate blockages and imbalances with deep muscle compression, stretches, acupressure, and other staples of this treatment.